MAESTRO LUIGI! I'm back! What? We're going to the Lab? But this is Music Class, not Science Class! Oh, I get it - Listening Lab! Come on, all you listening ears out there! Join Maestro Luigi and his trusted baton for a multimedia study of some of the great masterworks by Haydn, Camille Saint-Saens, Henry Mancini, George Gershwin, John Williams and more! Luigi's Baton will entertain with recorded fun facts about the composers and their writings, and students will become actively engaged with full-color listening maps while listening to quality orchestral recordings. A DIGITAL STUDENT edition comes with the Teacher Edition, so you can project or print from your computer! 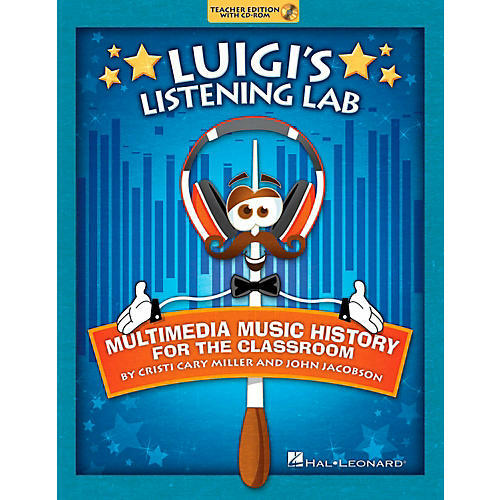 This enclosed student CD-ROM features projectable full-color listening maps with embedded audio recordings and Luigi's story tracks, so you can listen and watch with a single click ... all set in a user-friendly PDF format that uses Adobe Reader 9.0 or higher. There are also printable black/white stories and maps. The Teacher Edition offers easy-to-present lesson plans linked to the National Standards for all the material. Make sure to put this incredible interactive resource on your "must have" list! Orchestral Recordings include: Alexander's Ragtime Band, An American in Paris, The Aquarium (from Carnival of the Animals), Galop (from The Comedians), The Imperial March (from Star Wars), O Fortuna (from Carmina Burana), The Peter Gunn Theme, Rondeau, The Skaters, Symphony No. 94 (The Surprise Symphony). Suggested for grades 3-6.